Being a son and a grandson of a farmer made me spend my whole childhood in the family’s farm. 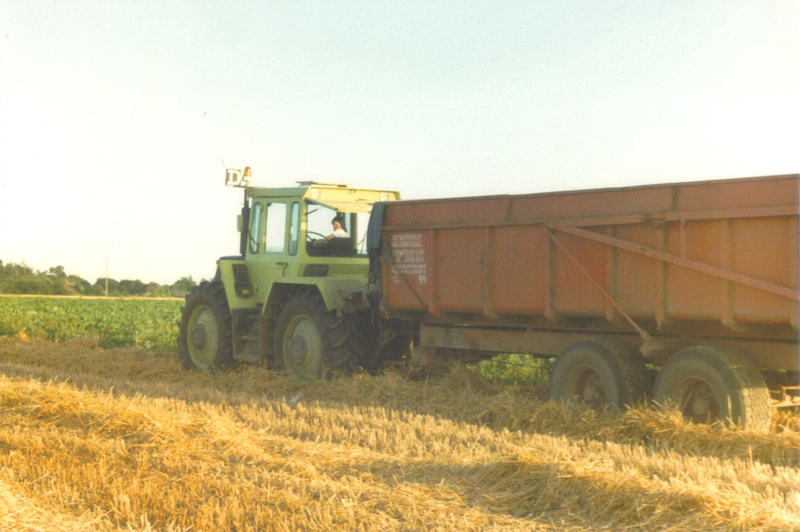 My cousins and I had a lot of pleasure driving tractors during the holidays, to collect straw balls for instance or to sort potatoes out, which was less pleasant! And as every farmer’s son we knew how to drive a tractor before a car. I also remember harvest time that was really tough and absorbing. As soon as I was 16, I was essentially driving tractors to transport the grain to farming cooperative from 11 am to 3 am. When I was alone on the road at night, driving a Mercedes MbTrac 1500 and a Ponthieux 18T trailer, I had a weird feeling, like I still don’t have my driver’s license, among others. In the same time, I discovered informatics and 3D drawing and became passionate. 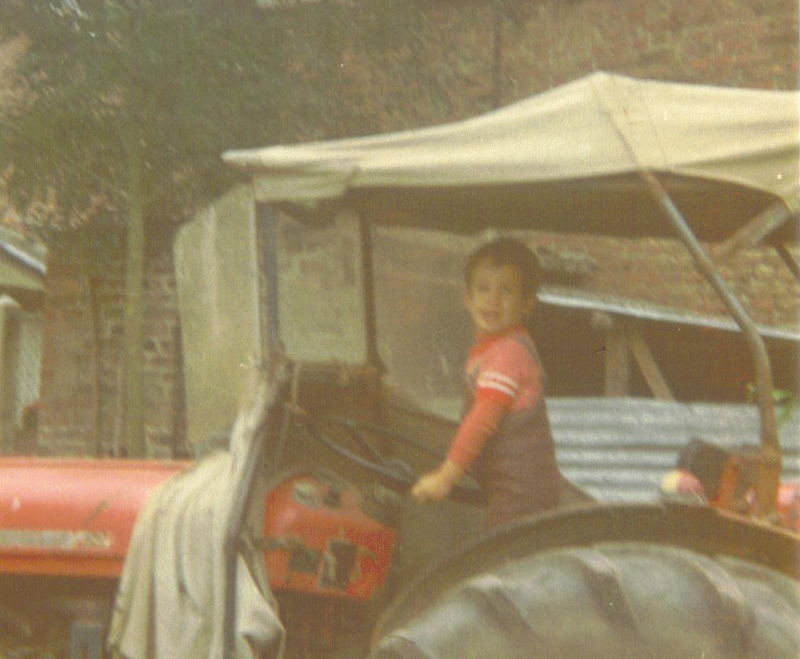 After my studies in that particular field, I decided several years later to go back to work in the family’s farm. 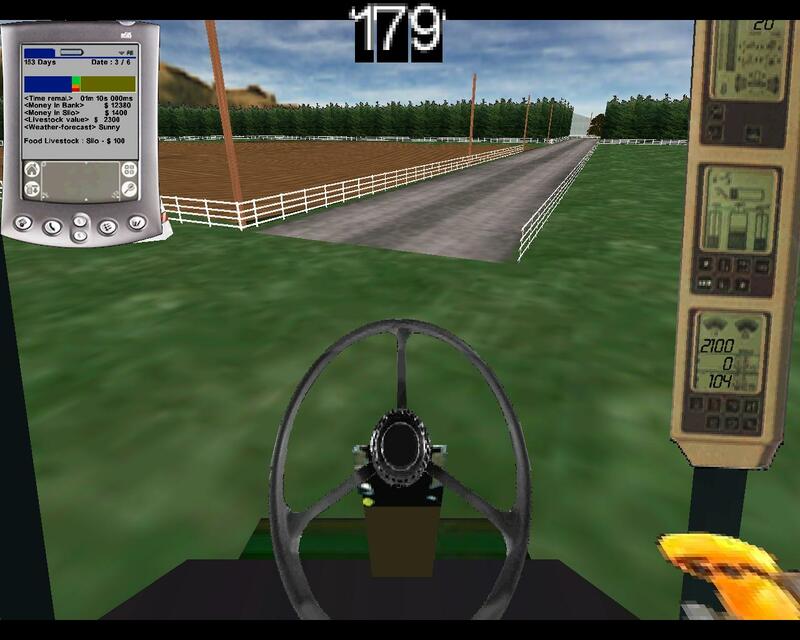 In the 2000’s I was looking at children watching us attentively as we were driving agricultural machines, and that’s when I had the idea to create an application of an agricultural driving simulation. Children who are « fond of tractors” only want one thing: to drive the tractor! This observation and the fact that I discovered a 3D creation software in a specialized magazine some time before made me think of some concepts which were easy to make, and that I used to create SimTractor. Today most of those concepts are used by the “SimTractor like”, in comparison with the “doom like” – loads of games that were created after the creation of a game called “doom”–. I shared the first creations of the game with my relatives, and they liked it. The principle is simple, you have to drive agricultural machines to cultivate lands and so to earn money in order to buy new machines and to keep on managing your farm year after year. When the game starts the menu allows you to make some adjustments and then to go into the 3D game by a machinery menu. The Business menu allows you to manage the buying and selling of agricultural machinery. A little engine of vegetal culture manages permanently the cultures such as harvest, sowing…which is linked to the machines. A PDA will be added then to relate the cultures management, the time –calendar–… and the player. One year later, a first version which is conform to my first vision is released, I decided to call it « SimTractor » Sim for simulation and Tractor in English. Why in English? Because I decided to share it on the internet. But internet was still in its beginning in France, ADSL didn’t exist in the country, and there was no forum on agriculture in French, and even less on agricultural machinery. The only forum I was used to read was “Farmphoto.com”, it’s an international forum dedicated to agriculture and agricultural machinery of the entire world, illustrated with pictures. I became addicted to it because of the huge agricultural fields of the USA and Canada. I discovered the extent of John Deere on this forum. In the meantime, the family farm bought two brand new tractors, John Deere of course! And as I knew very well how they work, I adopted them for the game. So I created the game in English to share it with the whole world and a website called www.simtractor.com. Some screenshots of the game were published on the forum farmphoto.com to introduce it, and it is appreciated for its innovation and originality. The owner of the forum farmphoto, Stuart Pocknee and his brother offered me to create a partnership, which means that I let some of my bandwidth to host some of their pictures on my site and they publish a link of my website on their forum. I quickly decided to formalize the application, so I contacted Virtools in order to obtain the software license, as “Virtools DEV” is the software I used to create SimTractor. It was huge investment, but they understood that the project was original and they helped me having it. I decided to broadcast the game in shareware by putting in place a key license system. The player could try and freely discovered the game before he/she decided to buy his/her key license to unlock it. I kept on developing the game in order to release a new version, with more applications, this will be the 2.0 version, with more machines notably. In 2003, a member of the forum contacted me, he wanted to put a forum on SimTractor in place, so that the players could share their ideas on the game use. This forum is finally added on the website in 2003, today it gathered about 8000 members and 95000 articles. The ideas shared by the players through this forum helped me a lot in the development process of the different versions. And first of all, it is a way to share between players. In 2004 the 3.1 version was available. The big changing, that is not really noticeable for the players, is the machines’ externalization. Indeed, the “engine” and the “graphics” (3D objects) of the machines have been separated from the game itself. The latter is only made up of a farm with its land around a mounted landscape, a calendar of time managing –PDA–, and a culture management engine. The machines are imported into the game only if the player decides to buy it through the « business” menu of SimTractor, and then they interact with the game elements, that is to say the land, the calendar, the weather… This concept allows, on one hand, to reduce the computer processing power and memory, and on the other hand, it becomes easier to duplicate the same types of machines. For instance, a 7930 John Deere tractor and a 6930 John Deere tractor can receive the same AutoPower IVT transmission and the same “engine” with just a different power parameter (horsepower), and of course, different graphics as the shape is not the same. Once this work done, the biggest task for the versions to come will be to add new machines. Indeed, the success of this agricultural concept — which will stay unique until 2007– is well know on the web, and a lot of players share on the forum about the use of the game, but also to write their wishes for the versions to come. These wishes are expressed in a special section of the forum called “Wish List ». Most of these requests talk about adding new machines. The machines represent the main asset of the cause because of the embedded technology and their limitless innovation. The biggest part of the work consists in modeling the new machines and their behavior. Some of the players, too passionate to wait for the new machines, decided to modify the texture –the colour– of tractors that were already in the game. Indeed, everyone has a favorite tractor brand. And that is how you can find John Deere tractors changed into Claas, New Holland…The modification of the machine’s colour is called “skins”, it is all about changing the skin of the tractor –the shape is left unchanged contrary to the “mods”, where the shape can be modified to–. A new section will be created on the forum for the players to share the skins they created. Given the extent of the skins created, a forum member (Craig, alias « Dear John ») and his brother –web developer– decided to create a site to host and manage skins created by players, the site will soon become as famous as SimTractor: www.simtractor.net –http://www.simtractor.com/dload.php –. An arborescence will be created for each make of tractor. - COIGNART Paul –French, help with the development of new machines and behavior–. - Craig –English, alias « Dear John » creator of www.simtractor.net and of many skins–. - MITCHELL Robert –Scotland, alias « bobalobmitchell”, first network tests of SimTractor–. - PETERSON Russell –English, alias « NorthReston”, moderator, help with the development of new machines and behavior–. - PETITJEAN David –French, alias « FULLPOWERSHIFT », help with the development of new machines and unconditional beta tester, creator of the skins site www.skintractor.fr –. The official forum of SimTractor being in English, others members decided to create other forums about the game in their own language, I’m thinking about www.tsforum3.com, a French forum created by Olivier Beauchemin –Canadian– for the French community of the game. Throughout the development of the game, I tried to keep them informed about the new features of the game. A German forum will also be created. In 2006, the 3.5 and the 3.6 version are available with new machines. From this version, I notice that the launching of the versions are more and more stressful as the content of the application is more important, and it becomes hard to foresee all the problems –bugs– that the player could face. Moreover, the number of players is growing bigger, so I had to avoid bugs as much as possible before the official launching. From these versions, David and other members of the moderating team helped me to resolve bugs by doing a lot of tests on the application before the launching. Then, a private section will be created on the forum to make such exchanges and returns on the application easier. Following this competition, a German video games publisher “Astragon” contacted me, he wants to publish SimTractor in his country. After several emails, I decided not to accept his proposition, because for me, my objective about the game development is still not reached. Dirk Ohler (Astragon product manager) warned me that, if there is no agreement between us, so he will contract out the creation of the same type of game for less to make it profitable, and with all the competition that will result. « Farming simulator » was born. https://www.farming-simulator.com. “Farming Simulator” has been outsourced so far in Switzerland (Giants Company). For my part, I keep on developing the fourth version of SimTractor to make it available in 2007 and then the 4.1 version. This version brings a lot of new things, such as a system to help guiding vehicles, a land management map, a milking robot with a cattle management on the PDA. And, of course new machines and a new landscape. This version will need more than a month tests with David and the moderating team. After the launching of this version, I finally decided to stop the game development. 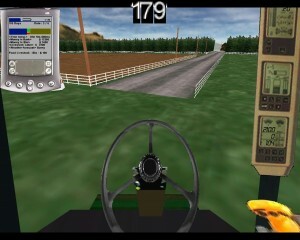 For two reasons: First, I reached the objective I wanted to in the gameplay, and second, the competition with Farming Simulator wouldn’t have allowed the continuity of the project, economically speaking–considering the will of Astragon to become the leader in this field and its wish to make it a main product in its range–. In any case, I will keep good memories of this experience, and the meetings it has generated. And I’m finally proud and happy to have invented this type of application and brought some dream to the players…. SimTractor V4 is finaly available. It presents new features to have a better game play and always improvments, and of course new exciting machines. I also plan to add new machines and implements during the next few months (like the mineral fertilizer,..), a public download/upload area will be available. Have fun ! SimTractor Forum Share tips, stratagy or ideas you have about the game. SimTractor SHOP - What's new !